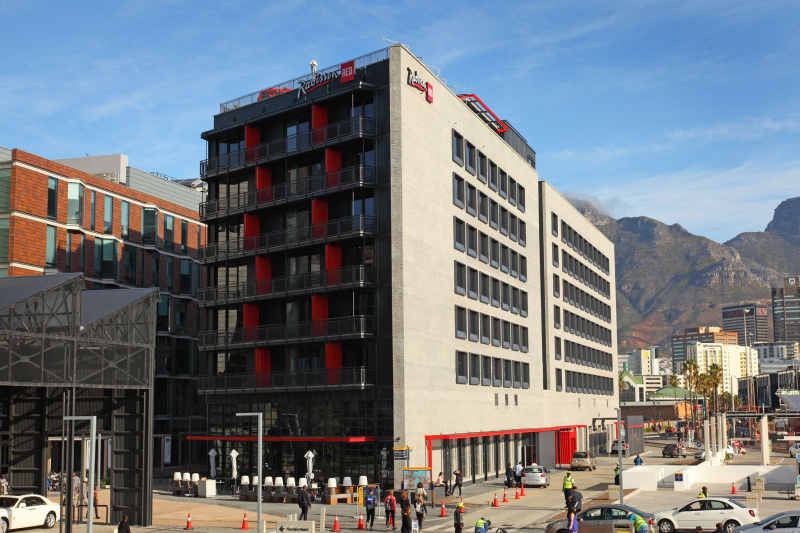 The use of natural materials and energy-efficient design contributed towards the five-star Green Star rating awarded to the Radisson RED hotel building in Cape Town – the first Green Star Custom Hotel rating for the design and construction of a new build. Located in the Silo district on the V&A Waterfront, the artful interior includes a combination of face bricks creating a rich facade, which corresponds with the Zeitz Museum of Contemporary Art Africa within the grain silo building, adjacent to the hotel. Completed in September 2017, the Radisson RED hotel was built using about 160 000 of Corobrik’s De Hoop Red Smooth Blended face bricks for the exterior. Selected for its durability, heat resistance and sound insulation properties, clay brick is ideally suited for the harsh micro-climate and harbour conditions. Because of the hotel’s location, architectural firms DesignSpaceAfrica and Peerutin Architects wanted to create a robust building with an industrial character suited to its surrounds while providing a unique aesthetic presence. They therefore opted for second-grade De Hoop bricks with clean lines because of the imperfections that would achieve the weathered look they desired. This particular Corobrik product is zoned for use in these unique circumstances. “The industrial character we wanted was achieved by the irregular brick coursing as opposed to the typical, clean face-brick coursing,” explains Luyanda Mpahlwa, lead architect on the project and director of DesignSpaceAfrica. To tone down the red of the De Hoop bricks, the architects selected Keim, an organic external wall finish that can be applied with a render and weather-protective layer to improve the quality of the mortar to the same standard as the face brick, while preventing moisture penetration. The final effect is a subtle light grey finish with a silver, metallic wash which makes the facade shimmer when sunlight hits it. Caption main image: To achieve a slightly weathered look on the facade of the Radisson RED hotel building in the Silo district on the V&A Waterfront, second-grade De Hoop bricks were selected because of their imperfections. Keim, an organic external wall finish, was used to achieve a light grey finish with a silver, metallic wash.